Charles Rutenberg Realty has been somewhat of a dynamo since hitting the Real Estate scene 10 years ago. Most recently, the Agency has been reveling in a rapid influx of Agents, which included 45 new team members in Q3 (July to September). This continued success can be attributed both to the Agency's new Bronx office, as well as its never-faltering mission to differentiate itself in the Real Estate industry through cutting-edge approaches and personalized attention for its Agents. 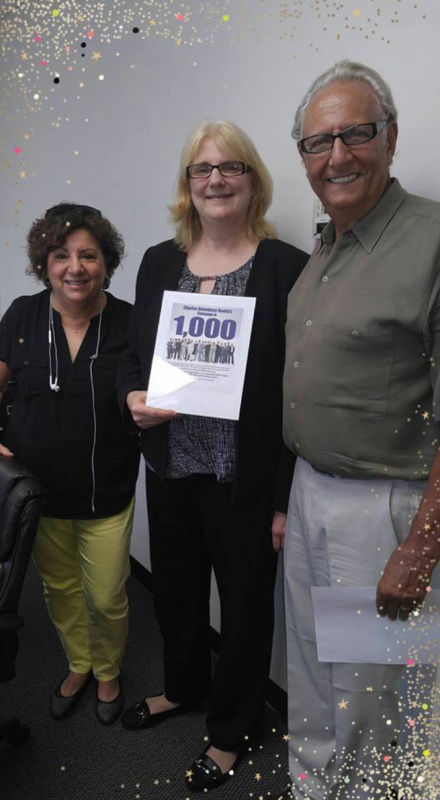 Among the newest Charles Rutenberg Agents is Denise Rueda, a newly licensed Agent who became lucky number 1,000 after joining the firm in early July. Ms. Rueda joined the firm on recommendation from her friend Eileen Collini, an Associate Broker for Charles Rutenberg Realty who is mentoring Ms. Rueda in the practice of Real Estate. What's more, thanks to a lucrative 1,000 Agents Contest, both Agents are benefitting from free dues for a year. In addition to Ms. Rueda, Charles Rutenberg Realty also welcomed 44 additional Agents from July through September, 35 of whom were previously associated with competing Agencies. In July, Charles Rutenberg added Amy Vultaggio, Samuel Reinoso, Kristen Yang, Hakim Taylor, Nelson Castillo, Mariana Ramos, Mariah Grossman, Dzmitry Naliuka, Daniel Cabane, Kent Markgraf, Maureen Haley Mizuno, Dean Ponce and Nicholas Veltri. In August, the Agency welcomed Janet Marmo, Jaaved Rahim, Hanna Wysocka, Sergio Jean-Louis, Luis Jose Suarez, Stefanie Maharana, Flor Bencosme, Dania Liu, Mohd Islam, Xiaoming Wei, Christina Esposito, Debra Ienna, Dianxiang Chen, Cinthia Chung-Yip, Marie Quaranta, Ofir Yakobowicz and Mary Or. And, in September, Jazzman Parker, Helen Lu, Stephanie Bowe, Andrew Ramdharry, Thomas Lupski, Vito DiMatteo, Peng Gao, Zorina Mohamed, Brian Fishkin, Merle Fishkin, Audrey Huston, Sherri Rivera, Anna Basel and Jianmin Zhu each joined the firm. Though the Agency works hard to recruit new members of its team, the majority of the recent additions have joined as a result of the encouragement from seasoned Rutenberg Agents. For those veterans, the benefits of working with the Agency are astounding: up to 100% commission; constant communications through multiple platforms; continual monthly training – including Real Estate trends and laws, marketing and basic computer courses, among others; and a variety of team building entertainment, such as the recent Tenth Anniversary Gala. While the financial aspect might be enticing, it's the Agency's support programs, especially those focused on leveraging modern technologies and communications platforms to generate sales leads that truly help its Agents succeed in their careers. Training topics focus on the latest market changes, trends, financing and compliance updates affecting the Real Estate industry, as well as self-improvement programs in the form of sales training, time management and wellness programs. Despite the size of the Agency, Charles Rutenberg Realty provides a close-knit atmosphere through social gatherings outside the office, such as its annual Top Producers Awards Banquet — which this year was expanded to all Agents – as a show of appreciation for the hard work and dedication of its Agents and employees. "Once new Agents join our team, they truly see first-hand what we have to offer — from the earning potential to the free training to the comradery — they discover that they are not just part of a company, but part of a family," says Joe Moshé, Broker/Owner, Charles Rutenberg Realty. "I look forward to getting to know each of these new Agents and I wish them all much success in their Real Estate careers!"